I think most people like a good burger. Their versatility means that no matter what your particular preference is, there is one out there for you. Even vegetarians can indulge, which is nice for them, as they miss out on so much. 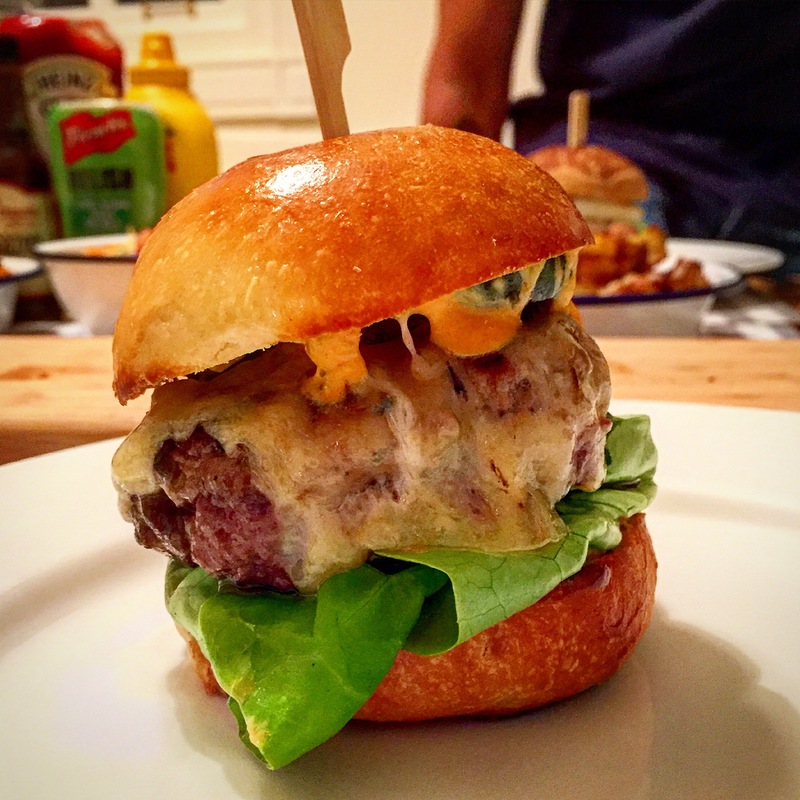 Bad burgers are pretty easy to come by. 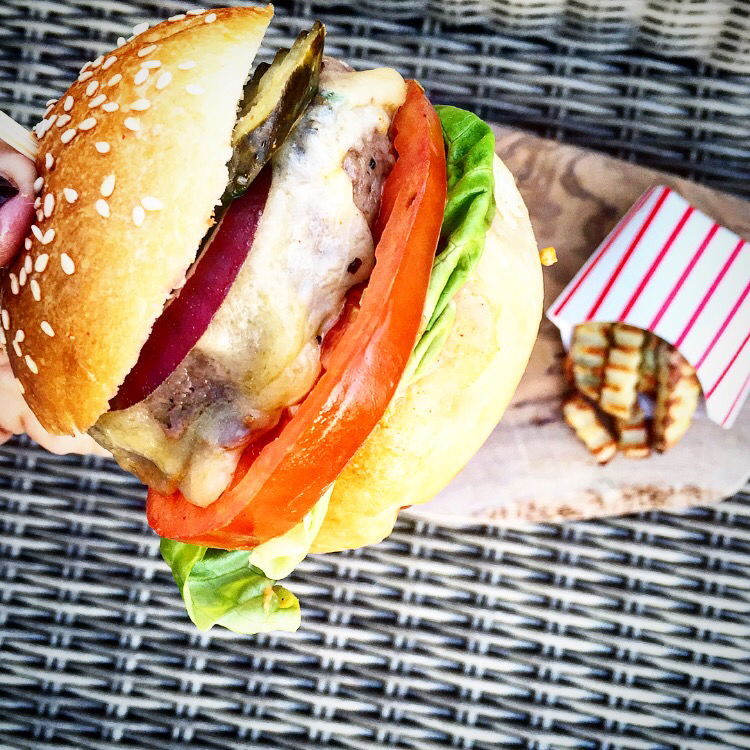 Thin, over cooked patties that taste of charcoal, soggy tomato soaked buns that dissolve before you even get them anywhere near the mouth, yuck. 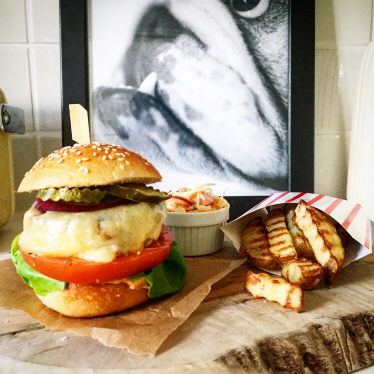 Having said that there’s a special place in my heart for both the gourmet burger and the fast food version too. I particularly like the buns that come with the latter, I think In-N-Out burger have got it spot on, if only we had them here in the UK. 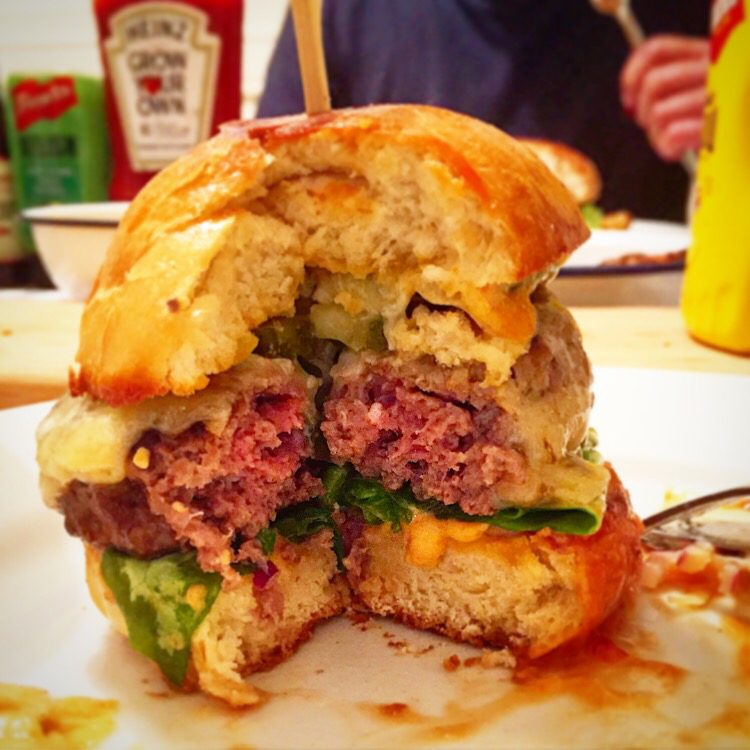 The gourmet burger often comes in some kind of artisan, brioche bun which, while I can appreciate the effort, it doesn’t really float my carb filled boat. There’s something quite magical about the super soft, almost squishy McDonalds style burger bun, it’s deliciously nostalgic and really sets the fast-food burger apart. Although I’ve given you a recipe here for garlic butter buns, which are really tasty, there’s so many good ready-made buns available now to choose from if you don’t have the time to make them. 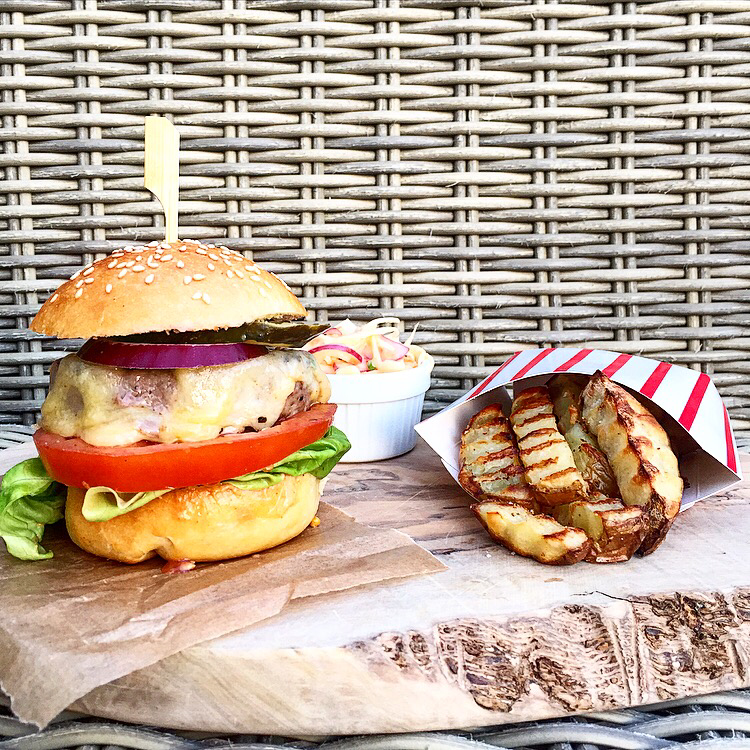 So this recipe is for my bank holiday burgers, if you can’t have a treat at the weekend when can you? As I’ve mentioned before when it comes to our diet we’re really trying to achieve a balance, which means it’s fine to indulge sometimes, but if you can indulge in a homemade treat it’s even better. Choose good quality ingredients and you’ll know exactly what you’re eating and be confident in the knowledge that it’s not full of processed ingredients and junk. Those are the things that we’re really tying to eliminate from our diets in order to help keep our bodies and minds fighting fit. Cutting out take-away and greasy fast food and exchanging them with homemade versions is a great way to treat ourselves while staying healthy. I hope you all enjoy some mindful cooking this weekend, don’t forget to tag @bakingyoubetter if you try any of my recipes- keep smiling and stay positive! * If you want to make crinkle fries you can get the crinkle cutter online here. Heat oven to 200C/180C fan/gas 6. Make the patties, mix the beef, garlic & onion powder, salt, pepper and the Parmesan until evenly combined. 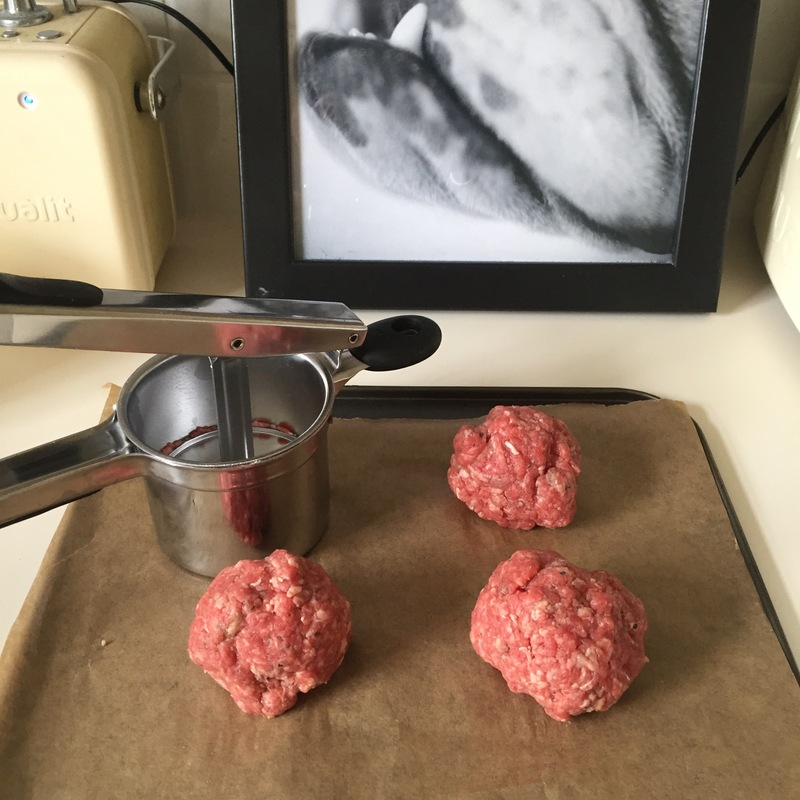 Divide into 6 rough balls and flatten to shape into burger patties. 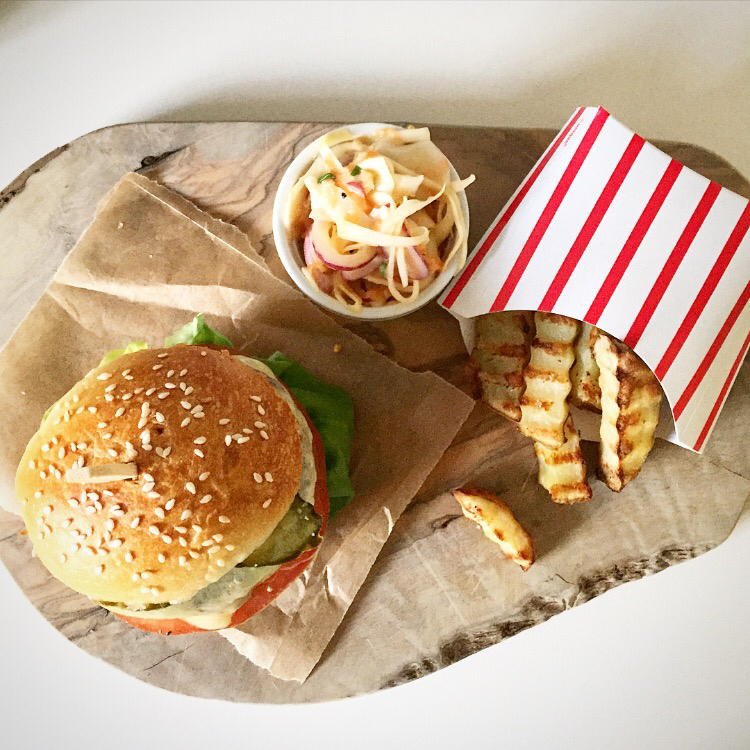 Keep on a tray lined with greaseproof in the fridge until ready to cook. Make the sauce by mixing all the ingredients. This will keep in the fridge for at least a week. 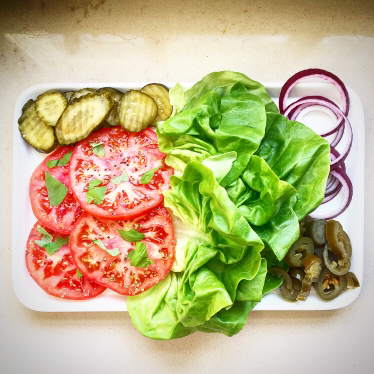 Slice the tomato, pickles, onions and shred the lettuce. 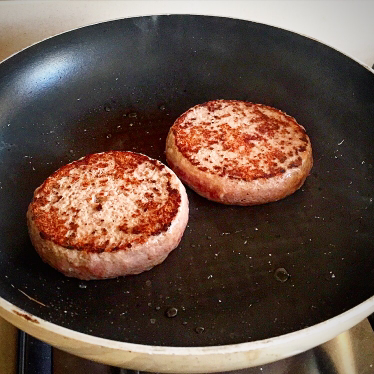 Heat a dry frying pan on a medium heat, cook the burgers (you may need to do this in batches) for 1 minute each side, until nicely browned. 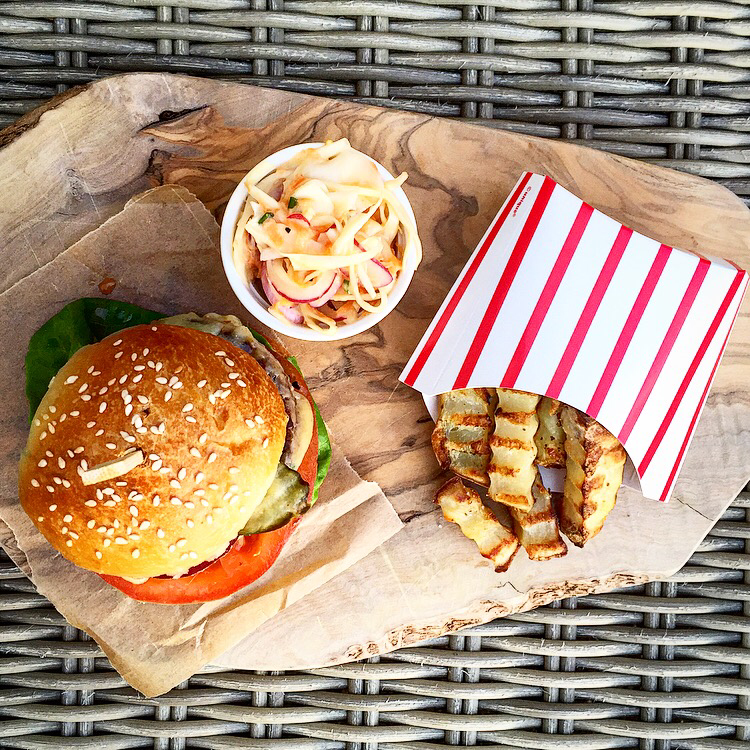 Transfer any browned burgers to a baking tray while you cook the rest. Once all browned top each one with a slice of cheese and cook in the oven for 5-7 minutes, until the burgers are hot through and the cheese is melted. 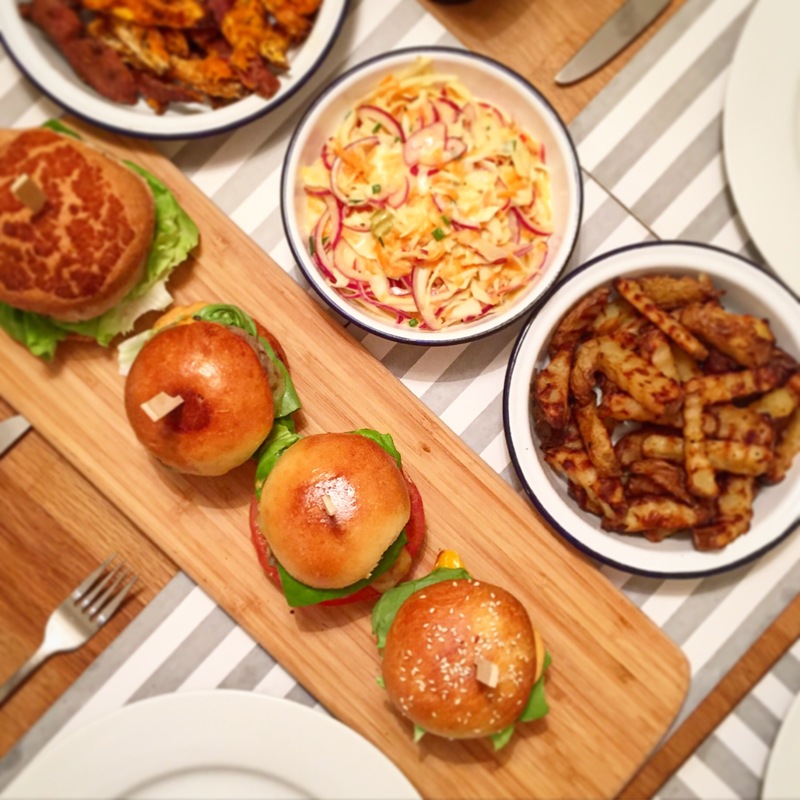 Slice the buns and toast if you like, load up with the sauce, salad and burgers. Serve with chips or sweet potato fries, if you like. Beat the egg with 2 tbsp milk until combined. Put the bowl of your mixer onto the scales, weigh out 50g of the egg and milk mixture (reserve the rest for glazing later, cover with cling film and keep in the fridge), add 30g melted butter to that then 10g of garlic puree, make up to 240g (total weight) with milk then stir in the sugar and the yeast. Add the flour and salt and mix on a slow speed until the dough comes together, now add 1 tbsp of the oil and continue to mix on slow for 5 minutes before adding the second tbsp. of oil and allowing the dough to mix for 5 minutes more. Remove and cover the bowl with cling film, chill for at least an hour or up to 8 hours, this makes the dough easier to work with. 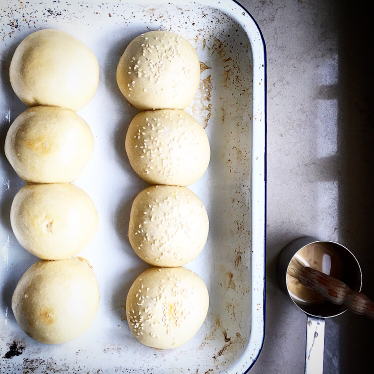 Divide into 8 balls and shape into rolls by pulling the sides of the dough back on itself (see video). Oil a roasting tray and place the balls in two rows of 4, spaced apart so they have room to rise. Cover with oiled cling film and leave at room temp until doubled in size, roughly 2 hours . Heat oven to 180C/160C fan/gas 4. 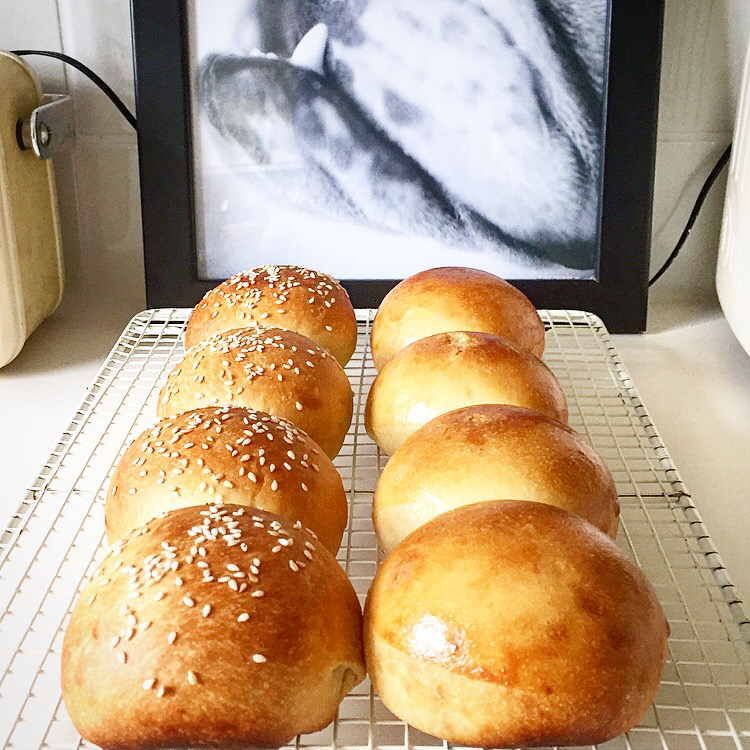 Glaze buns with the reserved milk and egg wash, sprinkle with sesame seeds now if using. Wrap the entire tray with oiled foil., this creates a humid environment so that the buns spring, but don’t brown too much. Bake for 20 minutes then remove the foil and turn the oven up to 220C, cook for 6-9 minutes more, until golden brown and risen. Cool on a wire rack until needed.